Baxter the border collie is living proof that you really can teach an old dog new tricks. The fun-loving canine is the first in Australia to sniff out fireweed – an invasive plant threatening the environment and cattle industry. Baxter spent seven days in training with owner Jacqui Diggins before showing off his new skills on the Atherton Tablelands in Far North Queensland. 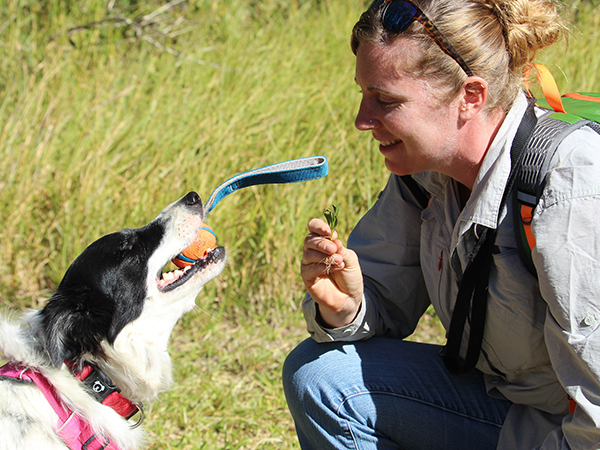 Baxter the border collie is rewarded with ball time after detecting fireweed, in trainer Jacqui Diggins’ hand. Fireweed is a daisy-like plant that competes with pasture and is toxic to livestock. Wet Tropics natural resource management organisation Terrain NRM hopes Baxter will help fight its spread as part of an initiative funded by Queensland Government’s Natural Resource Management Investment Program. Terrain NRM’s Evizel Seymour said Baxter had buoyed spirits. Baxter trained several years ago as an urban search and rescue sniffer dog to find missing people. But he was never deployed. Jacqui said her border collie was born blind in one eye. “It has never stopped him, or slowed him down,’’ she said. A Churchill Scholarship recipient for research into using detection dogs to support conservation programs, she has visited New Zealand and America to see the wide range of uses for detection dogs. “In Australia dogs are now being used for everything from feral cat detection to quoll surveys, koala and frog detections and in some cases weed detection,’’ she said. Fireweed: toxic to livestock and competes with pasture. Baxter’s reward for finding fireweed is “ball time”. “He knows there will be play – his ball comes out and usually it’s tug of war,’’ Jacqui said. 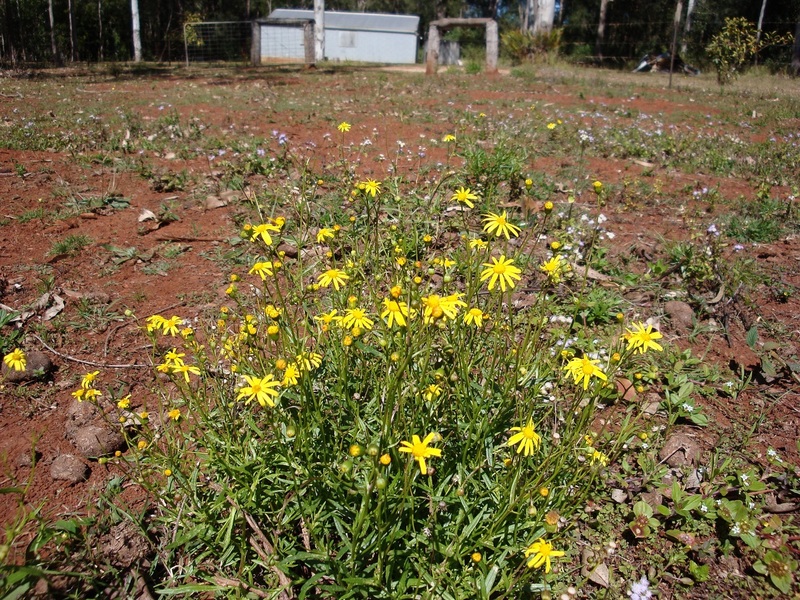 Fireweed is listed as a restricted invasive pest in Queensland. First detected in New South Wales, it has spread rapidly over the past 30 years and is now found along the entire coastline of New South Wales, along the coast to Brisbane and as far north as the Wet Tropics. Even light outbreaks can produce one million seeds per hectare. Evizel said intensive work at three isolated sites on the Tablelands had reduced fireweed infestations over the past 18 months on private land and along roadsides. “Having Baxter come in at the end, when plant numbers are low, will build our confidence of removing all plants in the area’’ she said.